An artist's illustration of plumes on the surface of Jupiter's moon Europa. The James Webb Space Telescope could help scientists study these plumes in more detail. The soon-to-launch James Webb Space Telescope will turn its powerful eye on two of the solar system's top candidates for hosting alien life: the icy moons Enceladus and Europa, the agency confirmed in a statement this month. Both Europa (a moon of Jupiter) and Enceladus (a moon of Saturn) are thought to possess subsurface oceans of liquid water beneath thick outer layers of ice. Both moons have also shown evidence of enormous plumes of liquid shooting up through cracks in the surface ice; these plumes could be caused by subsurface geysers, which could provide a source of heat and nutrients to life-forms there, scientists have said. The James Webb Space Telescope, nicknamed "Webb," will capture infrared light, which can be used to identify objects that generate heat but are not hot enough to radiate light (including humans, which is why many night-vision systems utilize infrared light). Researchers are hoping that Webb can help to identify regions on the surfaces of these moons where geologic activity, such as plume eruptions, are taking place. Enceladus' plumes were studied in detail by the Cassini probe at Saturn. The spacecraft spotted hundreds of plumes, and even flew through some of them and sampled their composition. 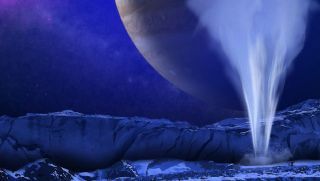 Europa's plumes were spotted by the Hubble Space Telescope, and researchers know far less about them than those on Enceladus. "Are they made of water ice? Is hot water vapor being released? What is the temperature of the active regions and the emitted water?" Geronimo Villanueva, lead scientist on the Webbobservation of Europa and Enceladus, said in the statement. "Webb telescope's measurements will allow us to address these questions with unprecedented accuracy and precision." Webb's observations will help pave the way for the Europa Clipper mission, a $2 billion orbital mission to the icy moon. Scheduled to launch in the 2020s, Europa Clipper will search for signs of life on Europa. The observations with Webb could identify areas of interest for the Europa Clipper mission to investigate, according to the statement. As seen by Webb, the Saturn moon Enceladus will appear about 10 times smaller than Europa, so scientists will not be able to capture high-resolution views of Enceladus' surface, according to the statement. However, Webb can still analyze the molecular composition of Enceladus' plumes. Artist rendering showing an interior cross-section of the crust of Enceladus, which shows how hydrothermal activity may be causing the plumes of water at the moon’s surface. But it's also possible that the observations won't catch a plume erupting from Europa's surface; scientists don't know how frequently these geysers erupt, and the limited observing time with Webb may not coincide with one of them. The telescope can detect organics — elements such as carbon that are essential to the formation of life as we know it — in the plumes. However, Villanueva cautioned that Webb does not have the power to directly detect life-forms in the plumes. Webb is set to launch in 2018 and will orbit the sun at the L2 Lagrange point, which is about one million miles (1.7 million km) farther from the sun than the Earth's orbit around the sun. The telescope will provide high-resolution views of both the very distant and very nearby universe. Scientists have already begun submitting ideas for objects or regions that should be observed using Webb's powerful eye, and Europa and Enceladus are among the objects that are now guaranteed observing time.